The first step is to note the order in which you planted your fields. Next, note silking dates of the field to project calendar days to when a field will mature. Once corn silks, approximately 55 to 60 days is required to achieve maturity at R6 or the “black layer” stage (Ritchie et al., 1993). Development during grain filling is influenced by temperature, but not as much as during the vegetative leaf emergence stages. Instead the number of days between pollination and a killing frost influence the time to maturity. So if an average killing frost occurs October 1st, then subtracting 55 to 60 days means that the crop must be silking by August 2nd-7th. Silage harvest usually begins around 50% kernel milk which is 42 to 47 days after silking, so silking must occur by August 15th-20th; but remember that the timing of silage harvest is dependent upon achieving the proper moisture for the storage structure (Table 1). By noting the order that fields silk it will help plan the harvest queue of your fields and scheduling of custom choppers. The next plant indicator that determines the order of fields to harvest is movement of the kernel milkline. 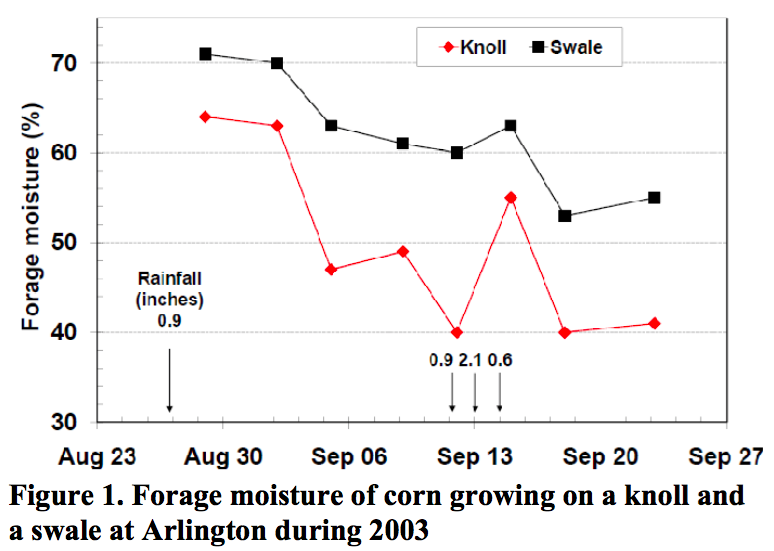 Once kernel milkline begins to move, measure moisture of fields intended to be harvested for silage (Table 1). To better time the initial sampling date begin when kernel milk reaches the appropriate “trigger” for the storage structure. You will likely be too wet, but you will have an indication of how quickly drydown is occurring when the next sampling date takes place. Ideally the field to be harvested is uniform in development, but the reality is that uniformity is rarely achieved. Separate uneven fields into representative groups. Figure 1 describes the moisture drydown patterns of two locations in the same field. Knoll areas were as much as 20% units different from swale areas. Heavy rainfall events rehydrated knoll areas to within 6% units. Sample two or more locations for each representative group in the field. Over time, sample the same locations – trying to determine the rate of drydown. Scott Hendrickson (Manitowoc county agent) measured whole-plant moisture over time at three sites in the county by always returning to the same location in the field (Figure 2). Depending upon year the average drydown rate ranged from 0.4 to 0.7 percent per day. Sample 3 to 5 plants in a row that are well bored and representative. Use 0.5% per day during September to predict the date when a field will be ready for the storage structure. If weather is warm and dry, use a faster rate of drydown (1999 and 2000 in Figure 2). If weather is cool and wet, use a slower rate of drydown (1996 and 2001 in Figure 2). We are most interested in the rate of corn silage drydown. 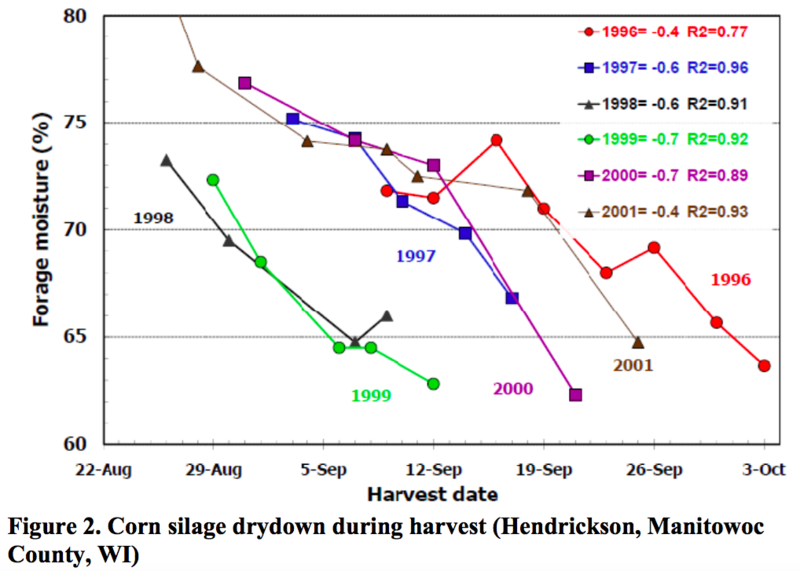 Wisconsin county agents have been accumulating corn silage drydown information since 1996. Results from county “Drydown Days” can be checked at the website http://www.uwex.edu/ces/ag/silagedrydown/ which averages and predicts area harvest dates. Peters, J. 2000. On-Farm Moisture Testing of Corn Silage [Online]. Available at https://fyi.extension.wisc.edu/forage/files/2014/01/CSMoistTest-FOF.htm_.pdf. Focus on Forages, UW-Madison. Ritchie, S.W., J.J. Hanway, and G.O. Benson, (eds.) 1993. How a corn plant develops, pp. 1-21 pp. ed. Iowa State Univ. Coop. Ext. Serv., Ames. Schedule first “Drydown Day” date for when corn is at the R5 stage. Best if weekly Drydown Days are scheduled. Sample corn in field from same site. Avoid border effects. Allows for tracking drydown rate of change. Arrange for people to help!